Welcome to Strasburg Home Town Days-a celebration to commemorate the joining of the first continuous railroad in the United States. It was 3:00 p.m. on August 15, 1870 when the Kansas Pacific Railroads met just east of Strasburg. There was not a big celebration - the American flag and a keg of whiskey sat at the center of the last 10 1/4 miles of track to be laid. The first crew from either the east or the west to reach the center was the winner. The east team reached the center point and continued on to meet the west team. 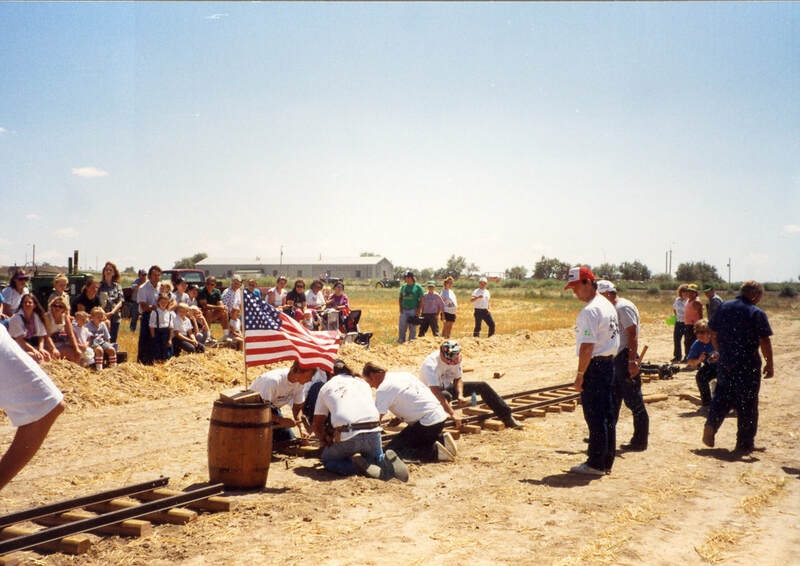 When the last spike was driven, a new record for laying track was set. When the rails were joined at Promontory, Utah in May 1869, the Union Pacific Railroad did not have a railroad bridge across the Missouri River. The only way to cross the Missouri River was by ferry boat. The Kansas Pacific Railroad had a railroad bridge spanning the Missouri River giving it the first continuous link. Home Town Days began in August 1970 to celebrate the opening of the new Comanche Crossing Historical Society's Museum and as a fundraiser for the Museum. The day began with a parade followed by many activities such as bread making, wheat threshing and a re-enactment of the joining of the rails. The Museum continued to coordinate the Home Town Days celebration for several years until the Home Town Days Committee was formed. The Committee is comprised of 10 dedicated volunteers, some with over 20 year's dedication. The parade has grown from 25 entries in 1970 to over 100 entries in 2005. The festivities are held the second weekend in August on the school grounds and museum. Most actvities are free, including the barbecue which is sponsored by Guaranty Bank and Trust. There is an Arts and Crafts show, games for the kids, live entertainment during the barbeque, a quilt show, mud volleyball, chili cook-off, rodeo, watermelon feed, and car show. Included on this site are entry forms for some of the activities, the schedule of events, a map for easier navigation and a few of our favorite pictures over the years. Come join us for a fun weekend and home town spirit..
"Our Side of the Mountain"